South Jersey, as it is known, has a strange geographical “thing” going on. Doesn’t that sound professional? I don’t know what to call it and I really do not care what it is suppose to be termed. It is a pine forest mostly made up of some kind of pygmy pines and white sand mixed in with dirt and rivers and streams all made of Root Beer Water. Yes, I said Root Beer Water! 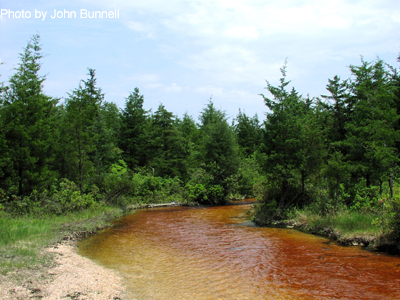 The water is the color of root beer or sassafras tea. I think the color is from cedar trees – but whatever. Like I said above, I really am not interested in the science behind it. This post is MY memories of the shore. And as through the eyes of a young child – it’s root beer water. Of course, I do believe my Uncle Runny supported my imagination on that and he probably was the source of that belief. He even told me that if I drank the water from the faucet of their tiny summer cottage – the water that stained your sinks brown and smelled and tasted of metal – my hair would curl. I drank a lot to no avail. I still had straight hair. Very disappointed. The days my mom told us to pack our swim suits and towels because we were going to Lanoka Harbor, well, they were some of the best memories. My Aunt and Uncle and cousin Paul had a lovely little cottage set among tall skinny trees where the ground was spattered with dirt and fine white sand. It smelled delicious. We all crammed into this cottage and slept – who knows where. We ate on the screened in porch. We waved to the neighbors. My Aunt would hand us bowls and tell us to go across the street to pick wild blueberries so she could make a pie. I hated blueberries then. But I loved the idea of picking them ourselves so she can make a pie that I never ate. Love them now and can’t get enough of them. Later we would hop on bikes (me on the handle bars of cousin Paul’s) and rode fast down to the bay beach. There was a giant metal swing set in the sand. 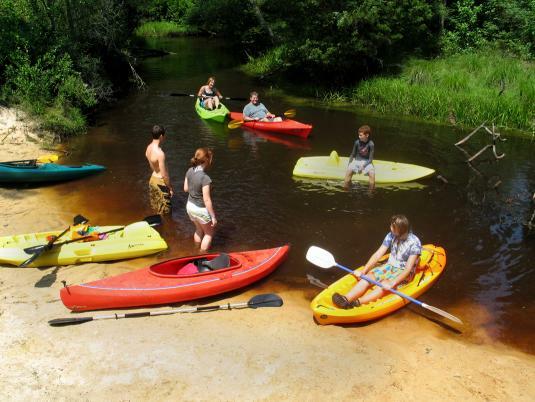 Other days – or sometimes in the same day – we took off on bikes in the other direction and swam in the creek. The creek was the finest and coolest root beer water. You could see your feet in the sand and schools of little black minnow – type fish swam around you, tickling. My older brother and Paul swam out to the bridge that ran over the creek and climbed up and jumped in. They were my heroes. Uncle Runny liked to go to the boat docks. I have no idea why, other than to look at the boats and talk to people. Maybe he had a boat….. Maybe we went out on it…… I do not remember that. Uncle Runny was a very kind man. He was a very quiet man. I rarely remember him having long conversations, especially with me. He had three sons. I think a little girl was a curious thing to him. But he was so kind to me. I remember watching him in the water. He loved to swim. He would get out there, even in the ocean, and just swim back and forth. When he was ready for company, I went out with him and he just smiled and watched me jump over waves and encouraged me to just float over the waves. Good times. When I got my driving permit and I drove my mom and younger brother to visit the family at their cottage (thought my mom would have a heart attack when I passed someone) my Uncle Runny had just gotten a new giant cadillac and said to get in and drive him to the boat docks. It was like driving on air. I have no pictures of those days. No pictures of Uncle Runny. A couple of Aunt Marion (his wife and my mom’s sister) after he passed and she was quite older. But the images never leave my mind. Very special times. So, back to Root Beer Water. Some days we loaded into the car and went to Root Beer Lake. There are three lakes in the nearby town of Forked River (For-ked River). I believe they use to be (at least one or two of them) cranberry bogs. The one we frequented had a sandy beach and a concession stand with colorful awnings. It was great to swim in root beet water – so cool and refreshing. This lake had a road under the surface that was higher than the lake bottom where we swam. It went across the lake and my brother and cousin walked across every time. Still my heroes. I tried to go once and had a fear I would fall off the road into deep, deep water. Those were such good, sweet memories. I do hope we have made sweet memories for our children. And now we are making memories with our grandchildren. Life goes on. 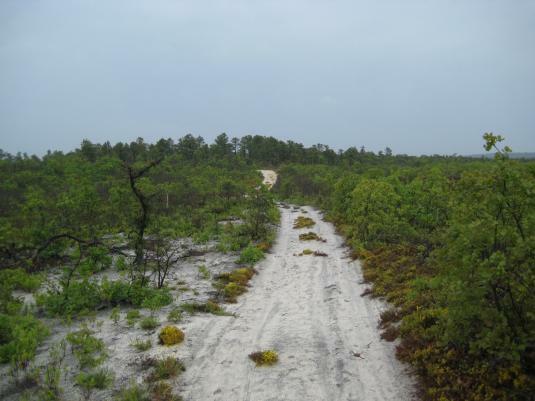 Here are some pics from the web I found of the Pine Barrens of South NJ. Check out the Root Beer Water! Thirsty for a Root Beer? Thank you for joining me in my memories of childhood at The Jersey Shore! Take time to make new memories for yourself and your children and grandchildren. They last forever! This entry was posted in Random and tagged bay, beach, creek, hope, Jersey Shore, memories, rivers, root beer, South Jersey, water on June 19, 2014 by Cate B.
Root beer water! Now how magical is that!??? Love it. And oh, can you imagine the horror of parents today seeing their child perched on someone’s bike handlebars? Ahhhh, those were the days…. Without pictures I had to paint my own from your words. Beautiful. Beautiful memories. Beautiful pictures. Lovely memories! Thanks for sharing them. Reminds me of my days of growing up in Massachusetts on a salt water river and the fun we had, as well as going to the ocean and to Cape Cod Bay many times where family members had cottages! Great days those were! oh how I love your stories…(they sound so much like some of mine)…but I love your enthusiasm as you tell them, it kind of gives the feel of actually being there with you…hmmmm, maybe it’s time for you to write another book (food for thought lol).